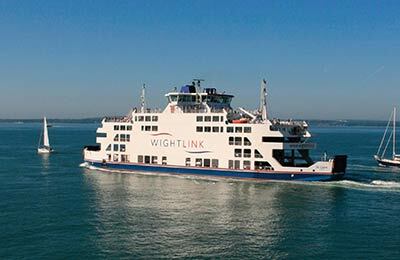 Compare up to 66 daily Isle of Wight ferry crossings with AFerry. Crossing times range from 22 to 45 minutes, depending on whether you need to take your car and which route you decide to take. See below for details on each route, port addresses and schedule times. 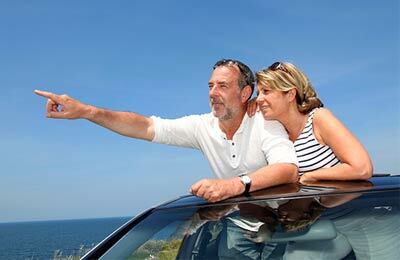 Or, alternatively use our Ferry Search above for live route information and the latest prices. Lymington to Yarmouth is the quickest ferry crossing to the Isle of Wight for passengers travelling with a car, taking just 40 minutes. On board spacious Wightlink ferries, you can relax out on deck or in the comfortable lounges and grab refreshments from the café-bar. There are 16 daily crossings to choose from, with departures available between 5am and 9pm. Portsmouth to Fishbourne is a popular route because Portsmouth has excellent road and rail connections, and there are 26 daily crossings available allowing you to travel at almost any hour of the day. The crossing takes 45 minutes, and the facilities on board include comfortable lounges, an observation deck and a café-bar serving refreshments. The spacious Wightlink ferry can carry vehicles and foot passengers. Portsmouth to Ryde is one the quickest ways to reach the Isle of Wight, taking just 22 minutes on the fastcat catamaran. The route is ideal for foot passengers and cyclists, with excellent rail connections in Portsmouth and Ryde. 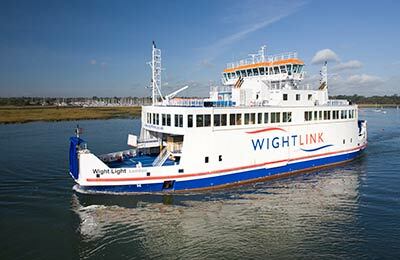 There are 24 daily departures with Wightlink, available all hours between 6am and 11pm. The most popular route for AFerry customers is Portsmouth to Fishbourne, and the lowest price found in October is £27 each way, based on two people travelling with a car.